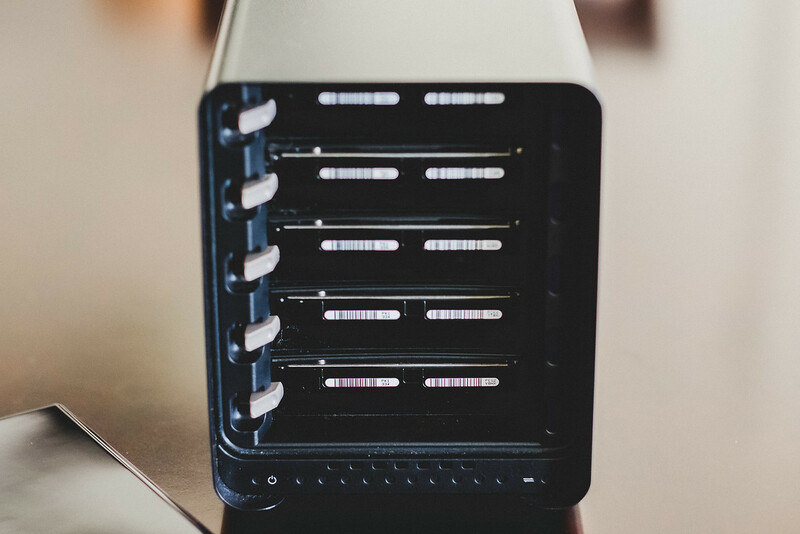 The Drobo 5D is one of the latest storage raids by Drobo that features a 5 disk array with a thunderbolt and USB 3.0 connection. 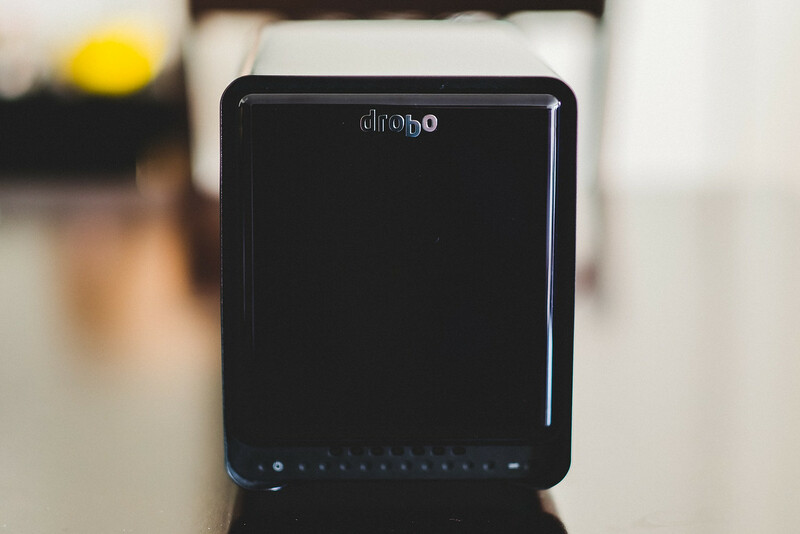 Drobo has gotten a sort of bad reputation over the last few years; many photographers gave up on them. But have they improved? Are they worth using again? To find out, I took the risk and purchased one to test out. So far, I’m pretty happy. On a Mac the Drobo 5D 20TB drive will actually give you 17.59TB of capacity when using the single disk redundancy. Two Thunderbolt 2.0 plugs that can be daisy chained when the unit is powered off but still plugged in. LED indicators for drive health and storage capacity. Tool free access to quickly swap drives. So I was a little hesitant going into it, but as a pretty technical guy with a lot of experience with raids, I figured I would give them a fair shot and an emotion free review. Reason #1: The main reason was I needed a raid that offered USB 3.0 and Thunderbolt. I’m still using my MacPro from 2009 and it only uses USB 3.0, while my laptop is a MacBook Pro from 2014 that can use Thunderbolt. I’m going to upgrade to an iMac eventually, I still want to get at least another year out of my MacPro and I don’t feel the iMac is there yet. So I wanted a drive that would be compatible with old generation USB 3.0 and current gen Thunderbolt. The Drobo was the only raid at the time of my purchase that offered Thunderbolt and USB 3.0. 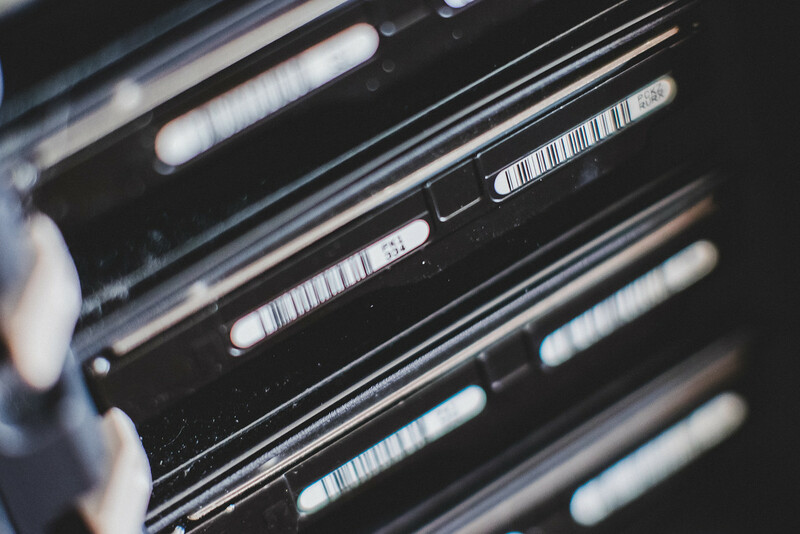 Reason #2: You can later upgrade the size of your hard drives without having to fully reconfigure your raid. Right now I have five 4TB drives making up a total of 20TB. In a few years when the 6TB drives come down in price, I can buy five new drives and one by one swap them out and Drobo will rewrite to the new drive without having to rebuilt the raid. This makes the Drobo probably the best future proof system you can buy. I’ve seen many sites review these raids when they are completely empty. I’m not going to benchmark this Drobo when empty, I actually did but I didn’t keep a record because it’s not relevant to real world use. I’ve filled my drive up to about 40% capacity, and will be doing all my speed tests here. Realistically you’re going to fill your drive up and you’ll likely be using it in a range from 25-75% capacity. And that’s what’s important here. Drive was at 44% capacity. Software used was AJA System Test for OSX. I originally was using Black Magic Speed Test but the results were so inconsistent and completely off from actual real use while watching the Activity Monitor that I have now written that software off as a trustworthy benchmarking tool. It applies to my experiences using it for my Memory Card Tests where I was forced to use Crystal Disk for Windows 8. USB 3.0 write speeds seem to bottleneck at around 200MB/s. The same was true with the other brands using eSata and USB3.0 This of course is a bottleneck of USB 3.0 and is not any fault in the drive performance. Transferring large movie files from the Drobo 5D to my internal Macbook Pro PCI memory, I saw some peak speeds of about 600MB/s in the activity monitor. The speeds here are sets of averages done by AJA System Test. 1 minute 38 seconds to mount is an excruciating long time. That’s just to mount. It takes even longer for the Drobo Dashboard to see the drive. Probably another minute. I also would not recommend using this drive unless it’s found by the Drobo Dashboard or else you will get random unmounts. While the Drobo on paper might not be as fast as some other raids from what I’ve read. At 44% drive capacity, the Drobo 5D still puts out a peak read speed of 444.3 and peak write speed of 378.6 when benchmarked across different file sizes. These are actually great working number and will work very well for almost any photographer with today’s cameras. The only time when a photographer might be impacted by these speeds is when saving large compositions. Many of my landscape photos taken with my Sony A7r II or even the Canon 5Dsr usually end up over 2GB in size as a PSD file or Tiff. Often times I’ll notice a sluggish hard drive when it comes to saving that file. The Macbook Pro internally gives me read and write speeds just shy of 1GB/s and the save time is nearly instant or a few seconds on files that large. On the Drobo there is a short moment of pause. Much better than the several minute wait when working with my single disk Lacie Travel Drives. For the video editor, these speeds are great. More than what I’ve been using considering I’ve been capped at around 200MB/s with eSata and USB 3.0 for the last several years. The Drobo 5D has been a great drive. USB 3.0 speeds are plenty fast for photography and even video editing. While Thunderbolt speeds are even better, I haven’t really felt that speed yet with anything I’ve done, unless I’m maybe transferring data from a solid state drive or another thunderbolt raid, which to be honest, you just don’t do a lot of in large enough quantities as a photographer for that to really matter. There are a few features this drive has that you won’t really see in other drives. mSata SSD – You can install a small mSata SSD drive in your Drobo to function as a cache. This essentially turns your Drobo into a hybrid drive. I haven’t tried this yet but it might be very useful when your drive starts to slow as it reaches near full capacity since typically raids slow down after breaking the 50% capacity barrier. Drobo recommends a mSata drive between 64GB-128GB. 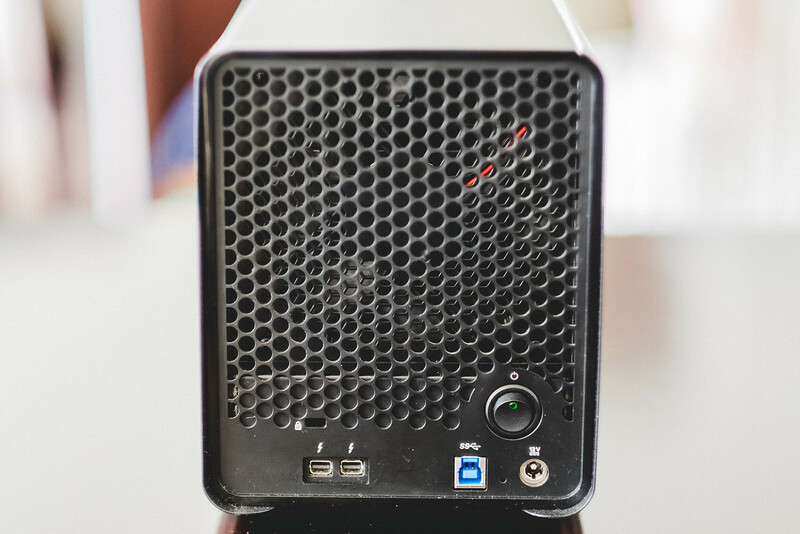 Battery Backup – The Drobo has a small built in battery to allow the drive to stay on long enough to finish writing so there is no memory loss during power outages. Mine is plugged into a battery backup power anyway so I don’t really use this feature. Expandable Design – You can later add larger hard drives to your Drobo without having to reconfigure your system. The drives construction is fantastic. It has a full metal body with a plastic front plate. You don’t need any tools to mount or remove any drives, and there are lights to tell you what drives are in good health as well as lights to indicate how full the drive is. My Drobo also uses HGST drives which have the lowest fail rate according to BackBlaze Harddrive reliability stats. I believe you can order your Drobo with other brands, but I chose the version with the HGST for this very reason. The Drobo is also very quiet. It makes some loud fan noise when booting up, but once it’s going it’s pretty quiet, other than the standard hard drive-working noises like any drive, but the fan at least on my Drobo has been very quiet. I’ve used some other raids that rattle and vibrate a lot. Like many of the Sonnet raids buzz, vibrate and rattle. The Drobo 5D runs very smooth. No vibrations, no rattling. This is where I throw up a huge caution sign. This thing claims to be user friendly but it is actually not. If you plan on have this drive mounted to one computer, then everything should be fine and what I’m about to tell you won’t really matter. Because the Drobo has it’s own proprietary raid configuration, it requires special software to run called the Drobo Dashboard. If you’re using the USB 3.0 + Thunderbolt model, you have to have and use the Drobo Dashboard with the latest updates and the latest drive firmware installed on every computer you want to use the Drobo with. The drive is not plug and play like every other hard drive on the planet. You have to mount the drive in a very specific sequence sometimes. Sometimes you don’t, sometimes it just work. The sequence sometimes goes like this. 1. Turn everything off and unplug the drive. 2. Turn on your computer, open Drobo Dashboard. 3. Plug your Drobe 5D in via USB 3.0 or Thunderbolt. 5. Wait a minute and a half for it to mount. 6. Wait even longer for the Drobo Dashboard to see it. This means I can’t just unmount and turn off the drive and plug it into my laptop and turn it back on. It usually takes me at least a half hour to get things working when I want to switch computers or between USB3.0 and Thunderbolt. Sometimes longer. It’s really crazy. After a firmware update, I could not get it working at all on my MacPro no matter what sequence I did. I thought the drive was dead until I tried it on my MacBook Pro where it mounted. After mounting it to my MacBook Pro I was then able to get it mounting on my MacPro. My advice to anyone that has their Drobo not mount is to try mounting it on a different computer with both USB 3.0 and Thunderbolt, following the sequence I mentioned. It worked for me. I Would Not Use A Drobo If . . .
– I wanted to share it between several computers. – I wanted a drive that could work on both PC and Mac. – I needed a drive I could move around a lot. I Would Use A Drobo If . . .
– I wanted both USB 3.0 and Thunderbolt connections. – I wanted a drive that I can expand on later. – I was only looking to have my device mounted to a single computer as a storage or backup solution. If I didn’t choose Drobo I would have without a second though gone with OWC. I’ve had so many problems with Lacie, and a few hiccups with Sonnet. That’s not just my experience with one unit. I’ve used maybe 10-15 Sonnet units, maybe 8 Lacies and probably about 4-5 OWC units. Lacie: My main problem with Lacies is the power adapters would always die on the older generation models. I’ve also had a lot of drives fail as they use Seagate drives. However the 4Big drive I’ve been using has been nothing but awesome, but still, I’ll still likely never buy a Lacie raid again. I should shoot you the photo of the pile of lacie 2Bigs I have that don’t work. But I won’t. That being said, their single disk external drives are nothing but amazing. I have several of them and love them. Sonnet: I’ve been using these the longest. I’ve actually found their older generation from probably 2009 to be more stable. With the new generation I’ve had a few inconstancies, the raid controller dying, or just acting up and taking forever to boot up. I’ve also had a drive or two go bad in these. But I have used these the most and am most likely to see more issues. OWC: I just started using these maybe about a year ago. So far they’ve been tanks. They are well built, boot up quickly, and have given us zero problems. I believe they also use Hitachi drives? Don’t quote me on that. They also boot up very quickly. Promise Pegasus: I don’t have any experience with Promise Pegasus. I know Trey Ratcliff loves his. A close friend of mine has one as well and says it’s been great. When it comes to speeds, all those units were running out of eSata or USB3.0 and all of them were quick enough to edit 1080p60 Prores(HQ) footage on a timeline stacked 7-15 layers high. The only time you would get some issues with speed is when the drive was start reaching near full capacity or when I would edit with Prores444. I’ve been using the Drobo for a few months now and so far I really like it. I’m very happy with it even though it’s sometimes a pain to switch between computers. If I had to do it all over again I would go Drobo again just because it’s quiet and runs very smooth.